Members of Antioch Baptist Church in Waterloo pose for a picture in 1914. Waterloo in the early part of the century. Waterloo had 29 African-American residents in 1910. By 1920 there were 856, most of them from towns along the Illinois Central Railroad -- Water Valley, Durant, and other places in Mississippi. They were recruited as strikebreakers. The men who came here first lived in boxcars, and later moved into an east-side area that formed a triangle near the tracks. Lee Smith, 94, remembers the bitterness. She was born in Water Valley, Miss., and her father was a Pullman porter. " It was the railroad that brought most people up from the South," she said. The Illinois Central offered blacks seven times what they made in the South. However, they found Waterloo wasn't exactly the promised land. We couldn't eat everywhere," she said. "That's one of the reasons my husband opened a restaurant. The Smiths had three daughters and a son. The daughters all went to school to become teachers, and then went to Washington, D.C., to find work. I knew I couldn't stay in Waterloo," said Betty Lou (Smith) Lawton, one of their daughters. African-American children couldn't wrestle or be cheerleaders or dance. The son, Clifford Smith, Jr., went to Jersey City, N.J. after medical school, but hated it. His wife and children went back to McGregor with him, but they didn't like Iowa, and left. He has Despite the outmigration, Waterloo became a center of African-American culture in Iowa; blacks grew to about 8 percent of the metropolitan population. In bold letters, the phrase "Railroad Jobs' blared atop posters nailed to tree trunks and advertisements in many black newspapers throught the deep South. 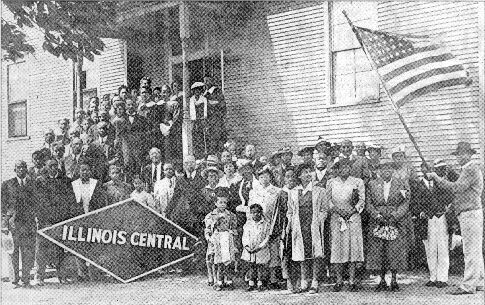 In 1911, The Illinois Central Railroad began a campaign that lured poor black men to Waterloo. The company wanted to break a strike by shopmen protesting low wages at the railroad's maintenance and repair terminal. The railroad supplied free passes all over the country to anyone willing to come to Waterloo and work. Not knowing about the strike, hundreds of African-American men left their families and made the trip north. Before 1911, there were 22 African-Americans in Waterloo. By the year's end, the number had risen to 395. Most blacks came from the South, a third from Mississippi. Others traveled from Georgia, Kentucky, North Carolina, Virginia. Tennessee, Missouri, Alabama, Arkansas, Illinois, Ohio and the Southwest. By then, Waterloo was well known as the "Factory City." It had more than 150 businesses and four railroads. Illinois Central was one of the largest in the United States. With the new influx, a housing problem quickly emerged. City laws mandated housing discrimination throught much of Waterloo. Most Aftrican-Americans were restricted to dilapidated over-crowded housing bounded by Summer and Mobile streets, the Illinois Central Railroad and Fourth Street Illinois Central allowed those without homes to sleep in boxcars. In 1915, only seven African-American families owned their homes in Waterloo. Whites made up 99.9 percent of West Waterloo and 80 percent of East Waterloo, with African-Americans composing the other 20 percent. Once they were settled two or three years later, many of the new workers sent for their families. For many, moving to Waterloo was a new beginning. It allowed African-Americans to work consistently, avoid lynchings, kidnapping or unemployment due to crop failure or floods. Yet the prejudice that pervaded the area and the country at the time was further complicated by animosity from the labor dispute. Blacks were not welcome in many of the restaurants and shops in Waterloo until much later. To help alleviate tension and stress, the church became a major focal point in the black community. It was a place to find fellowship and socialize freely, organize activist groups, voice conerns and receive support. Bess Chapel, Waterloo's first African-American church, was organized in 1911, followed by Antioch Baptist Church in 1912. Under the Rev. I.W. Bess, the African Episopal Church - now Payne Memorial AME - became involved in public issues, sponsored cleanup campaigns and founded a Big Brother Mission. Bess in 1914 led a fight for the rights of Waterloo blacks to swim in the Cedar River. Other blacks tried to better themselves, despite the barriers. In 1916, Vivian Smith earned a bachelor's degree in English from Iowa State Teachers College. She was the first black graduate of the school, which is now the University of Northern Iowa. In the 1920's, an African-American middle class began to develop and community members began orgainzing small fraternal and social organizations. An African-American Masonic Lodge was organized in 1915 as well as Eastern Star, a women's group. Knights of Pythia was founded in 1918. A Waterloo NAACP chapter formed in 1921. After Illinois Central began hiring African-Americans, other industried followed suit. Rath Packing Co., founded in 1891, didn't hire African-Americans until 1920; nor did John Deere and other large factories. As Rath packing and other factories grew, another surge of African-Americans from the South came to Waterloo seeking jobs. This time, many had families already lving in Waterloo when they arrived. By 1940, more than 1,500 African-Americans lived in Waterloo. Although many were qualified to work in skilled positions, African-Americans were restricted to beef, hog and sheep kills, at lower wages than white workers. As African-Americans migrated to Waterloo for employment at Rath in the 1940's and 1950s, a social conscious began to evolve. More than in th past the African-American community began to speak out and voice concerns, leading to considerable civil right activism here in the '60s and '70s. Editor's note: this story is from the 1993 Courier Annual Edition....and put forth by the coordinator of IAGenWeb Black Hawk County from Sunday, June 30, 1996 edition of "Iowa, 150 Celebrate Our State 1846 - 1996, Waterloo-Cedar Falls Courier.